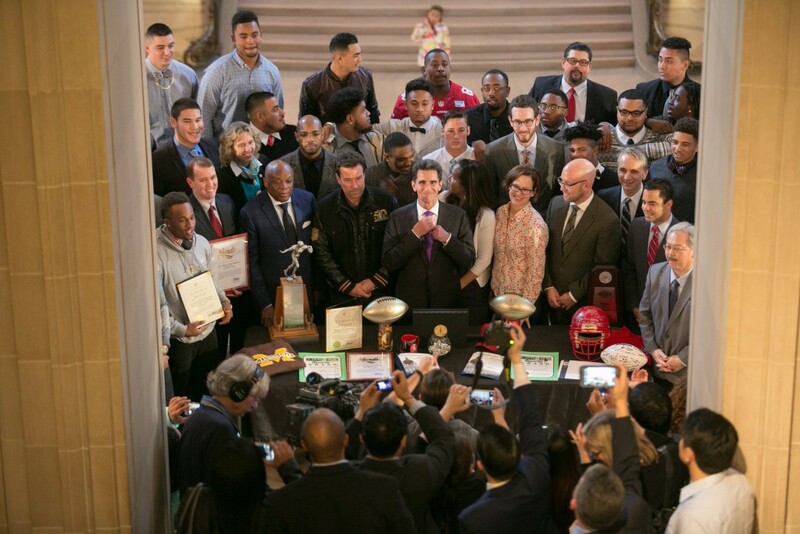 Cheers erupted through the ornate halls of San Francisco’s City Hall as the players and staff of the City College football team gathered to receive a proclamation of honor from Mayor Ed Lee and other dignitaries on the afternoon of Feb. 5, 2016. The Rams secured their tenth national junior college football title on Dec. 12, 2015, when they defeated the Saddleback College Gauchos in a 26–14 contest held at George Rush Stadium. It was the first title for the school under the guidance of new head coach Jimmy Collins, who inherited the program from longtime coach George Rush, the winningest junior-college coach in the nation’s history. Nearly two months after earning their second consecutive championship title, the team was proud to finally receive official recognition for their efforts. A table displayed their shining championship trophy to more than one hundred members of the Rams team and coaching staff gathered on the second floor balcony of City Hall to watch the Rams receive accolades from state Sen. Mark Leno and San Francisco Mayor Ed Lee. “I couldn’t think of a better way to kick off the weekend than to be with champions,” Mayor Lee said as he handed a symbolic golden football to coach Collins. Joining the mayor and senator were former San Francisco Mayor Willie Brown, the Super Bowl Host Committee, and San Francisco 49ers CEO Keith Bruce and 49ers center Marcus Martin. Coach Collins presented Mayor Lee with a football signed by the coaching staff and players of the championship team. The afternoon ended with officials posing for a group photo with the team and a renewed appreciation for football within the walls of City Hall. “This is a college that’s going to continue to thrive and set higher standards,” Leno said. For a team whose successes on the field have been overshadowed by City College’s accreditation crisis, the victory represents more than just athletic accomplishments. “This is a school that’s supposed to be a challenged school but continued to break all records,” Leno said.